Callac is a deeply traditional Breton town. Peaceful, pretty and rural, it is totally unspoiled and yet manages to provide most modern amenities. The town has a tranquil feel, and the gentle pace of life is perfect for those who want to kick back and relax. If you want to do a spot of sight-seeing there is an impressive Roman bridge in Callac. What more could anyone want? There are plenty of shops in the town, catering for everyday essentials and certain luxuries too. Two decent sized supermarkets mean that you are well supplied with groceries and household utensils, and then there two banks, boulangeries, hairdressers, shoe shops, a post office and electrical stores as well. If you are tired of shopping, and feeling indulgent, there is an excellent patisserie with its own tea shop where you can take a seat and enjoy one of the best pastries that France can supply! Market day in Callac is Wednesday, and this means that the pace of life changes for a short while from tranquil and slow to hustle and bustle... but of the nicest, and most traditional kind. All kinds of everything are on display here, and it is the ideal place to buy your fruit and veg, to sample local specialities such as the delicious Breton crêpes and other regional fare. There are a few historical monuments to see in Callac, such as the remains of the old parish church of Callac, the Church of Notre-Dame de Botmel, the Gallo Roman bridge and what is left of the castles of Callac. The first castle was built in the 12th century but was later deconstructed and its stones used to build mills nearby, the town's church and a tower. The second castle built in 1475, was demolished in the 16th century. 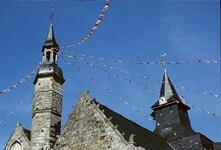 The town lies between Carhaix and Guingamp, both of which are interesting towns to visit, and which host some fantastic festivals during the summer months. The department of the Côtes d'Armor has lots of wonderful beaches, cliff paths and spectacular scenery to enjoy too, so getting out and about from Callac is highly recommended. Sports men and women too will rarely find themselves at a loss in or near Callac, as there is a wealth of sporting activities on offer as well as simple outdoor pursuits such as walking. Brittany prices (and specifically, Côtes d'Armor prices) are on the up, as the department is very popular, especially with wealthy foreign buyers. There are lots of compensations for these higher prices, however, including quality of life, ease of access from the UK, and good rental returns. Properties currently on the market include village and country houses of all sizes and, interestingly, a few chances to buy a traditional Breton longhouse. Properties of this calibre can be hard to find, so make the most of the chance and take a look at properties in and around this attractive town before the word has spread and there are none left. Do you know Callac better than we do? Do you have photos of Callac? Callac is located in north-western France. It lies in the west of the Côtes d'Armor department. Interesting fact: The traditional Breton language is still spoken by some locals.